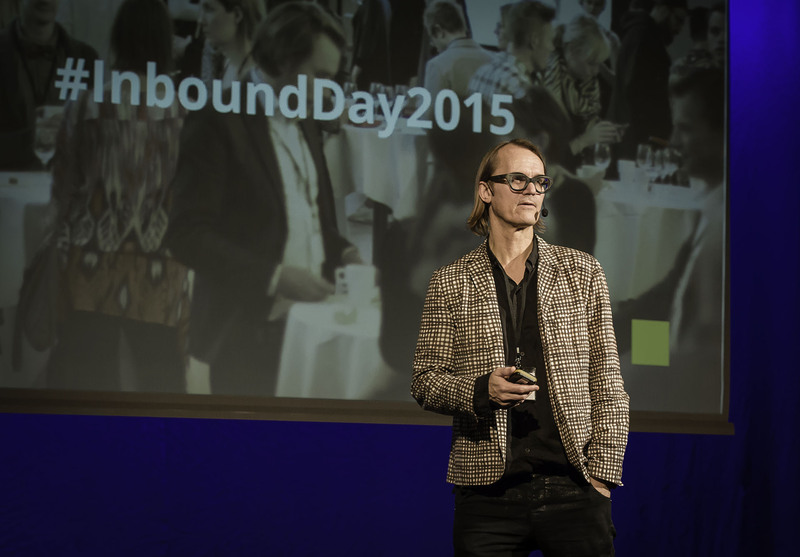 This is the first of three blog posts from #InboundDay2015. In this post we focus on insights. In the following post we will report from the sessions covering practical and tactical aspects of Inbound and in the third post we will cover knowledge shared by HubSpot. You are more than welcome today, this is how Anders Björklund started the day addressing about 150 people representing 30 different companies and 6 countries, that had decided to spend the day at Inbound Day. To begin with. Why Inbound Day? Why did it start and why is it taking place today? The purpose has always been to share knowledge & learning about modern marketing. The visitor should leave the day knowing what Inbound is, gain inspiration and also know what practical things you can do. Not the least, last year this event generated 5000 Euro to MSF and we will top that this year. First out was Pernilla Jonsson, Ericsson Consumer Lab. She entered the stage speaking on the subject Digionomics with the subtitle “The quiet revolution of digitally savvy consumers”. Pernilla stated that change will never be this slow again and that we are in for a ride. At Ericsson, Pernilla explained, they see this as an infliction point with three major forces at play. Almost every business is going to change into something different. Today education means constant learning and media means culture and so forth. Have you heard the term Netizens? – they incorporate more and more online activities into their lives. 25% of smartphone users in US shop online first thing in the morning! This drives a changing mind-set. We are becoming habituated to new ways of doing things. New needs are reshaped and redefined. In these new needs there are business potential. This is only getting started! 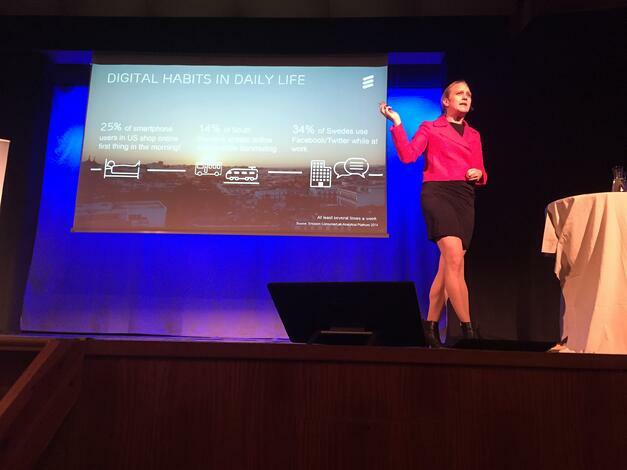 We know from the 100,000 interviews Ericsson consumer lab is conducting every year, Pernilla explained. Time and energy are the two scarce resources for consumers. And we have a window of opportunity to address this. For example commuting time, now they are not designed for us to be productive, instead we are just moved around like cattle. Expect to see something else. In just 5 years there will be 26 billion connected devices. Connectivity drives coolness, for example the car is rising on the list of desirable connected things. One of the most important trends now is servification. Every product is a service to happen! We can innovate on the new needs and provide a whole new set of services. 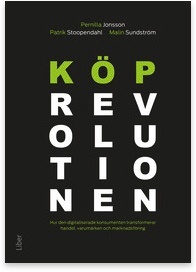 Pernilla presented her new book "I shop therefore I am" , Swedish title Köprevolutionen of which she is one of the authors. Think about how often you get a story of HOW someone bought an item when you commented on it. There are lots of examples you can read about in her warmly recommended book, but the conclusion is that “The couch is king”! The TV is just staying there as a fireplace. The attention is rather to the products. Consumers want something different, and they want to use the digital technology. We need to understand that branding and selling is intertwined. In his talk Martin Olausson, Chief analyst from Zooma, shared important and highly relevant key insights from an Inbound perspective about user behaviour. 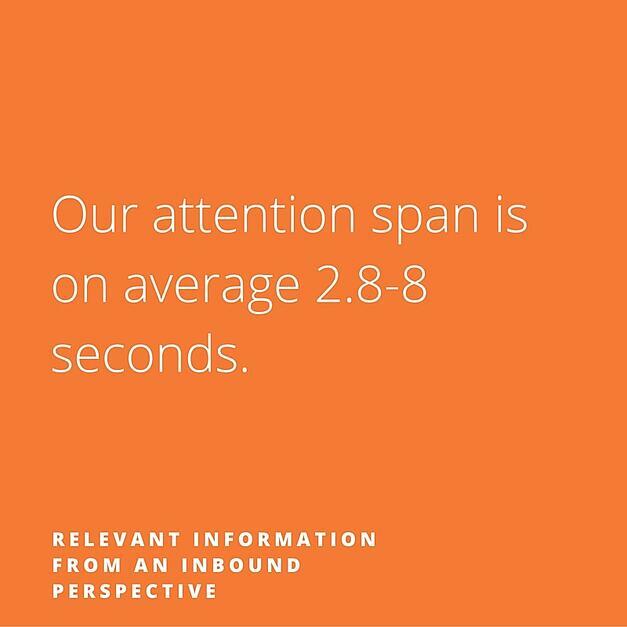 Our attention span 2.8-8 seconds, example think about if you do a search on Google, how long time does it take to decide if this is relevant. This figure is down from about 12 seconds 15 years ago. 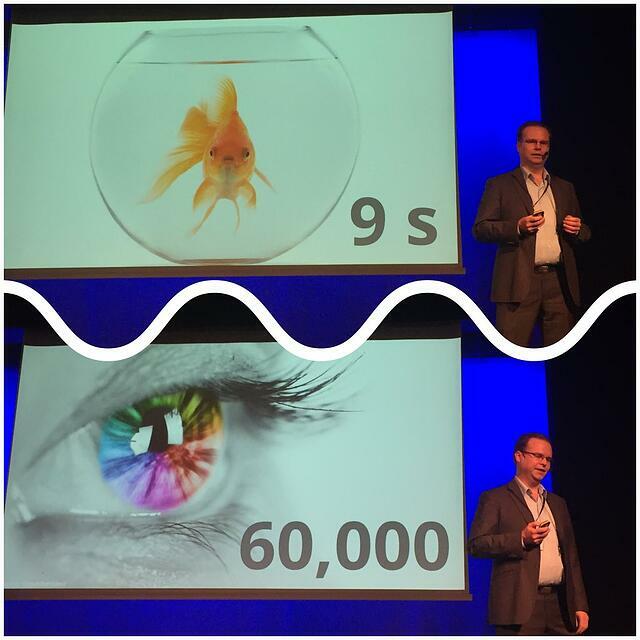 In fact we humans now have shorter attention span than a goldfish (which has about 9 seconds attention span). The brain process visual images much faster than text. 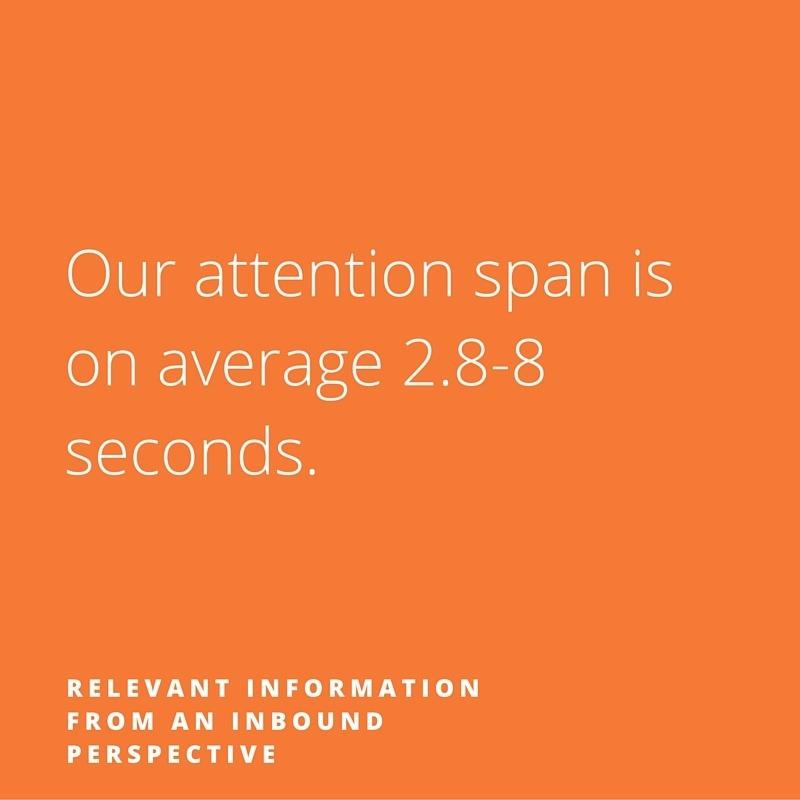 As the attention span gets shorter it therefore becomes increasingly important to use visuals in communication in order to convey as much information as possible in as little time as possible. One example of this is that you should always have images in blog posts in order to attract more attention when people are scanning for information. A B2B purchaser is on average 57% through the purchase decision when first contacting a supplier. Only 12% of B2B purchasers actually want a face-to-face meeting with a sales rep (and just 16% prefer phone contact with a sales rep). The rest of us prefer to handle the purchase on our own from start to end. Today there are 5.4 people on average that make the purchasing decisions within a B2B organisation. Before decisions were made by much fewer people. We need to influence all of them on their way to the decision using the right methods. And that is realistically only possible to do by using online to reach them. 46% the people that are looking for the material online, and are undertaking the initial research and due diligence, are actually quite young, under the age of 35. Presentations from the day have been filmed and will be made available to the participants of the #InboundDay2015 event in the coming weeks. Contact Zooma, if you did not attend and want to find out more.